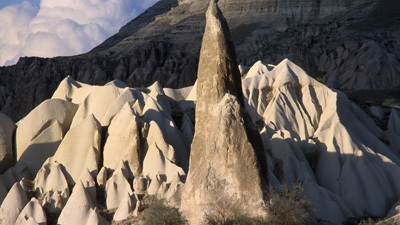 Welcome to Cappadocia... And to one of the world's most wonderful landscapes! Long, long ago three central Anatolian volcanoes, Erciyes, Hasan and Melendiz erupted and covered Cappadocia with layers of ash and bazalt. Over the centuries the wind and rain set to work, eating through the layers the hard rock on top until eventually the amazing moonscape of rocks and cones and valleys that you see today emerged. 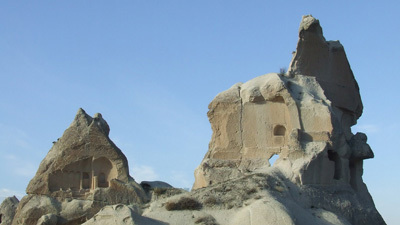 In early medieval times Cappadocia was part of the Byzantine Empire and Christian settlers soon realised that you could carve churches and chapels, even whole monasteries out of the rock. When Arab invaders threatened them, they even built whole cities underground, where they could hide for weeks at a time. 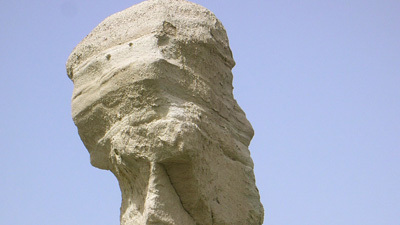 Even today many local people, including Mehmet, live in houses that are partly carved out of the rock. Over the last 25 years, the local population of Cappadocia has switched its main occupation from agriculture to tourism. This has resulted in the growth of different species of flora and fauna, because less and less chemicals are being used. Even some locally extinct species have come back to the area! Some of the wildlife you can meet on your walk are tortoises, foxes and eagles. Flora lovers can enjoy, among many others, orchids, wild asparagus, thyme and sage.